Lately, there has been a lot of focus on the importance of candidate experience. The value that candidate experience brings to a company is extremely powerful. A poor candidate experience can ruin an otherwise great company and employment opportunity. On the other hand, a great candidate experience has the power to give a company that competitive advantage in the hiring market place. I have come to realize that there are just not enough “positive” candidate experiences out there. In my own past job searches, I can’t even begin to count the lack of communication, lack of answers, and lack of genuine “care” for my candidacy. Any offers I received, my preference almost always went to the company that provided me with the best overall interview experience – the one where the recruiter was responsive and kept me informed, where the managers were very informative and interactive, and where I felt I was being treated like a human being rather than a “just another resume”. When I began my own interview process at SuccessFactors, I was overjoyed to find that my recruiter cared and made my interview experience fantastic. I could not have asked for more. As a company, SuccessFactors has always preached that we should “drink our own champagne”. And, so here I am, as a SuccessFactors Recruiter, sharing how I hope to provide you with a great candidate experience. SuccessFactors strives to keep as connected as possible with candidates through Twitter, Facebook, LinkedIn andGoogle+! To me, the definition of candidate experience is how a company (and its recruiters) approach the recruiting process – how they interact with the candidate, how the candidate feels throughout the process, and ultimately how that all affects the candidate’s decision making process. I firmly believe that recruiters have the power to influence an applicant’s attitude towards the company. They are, after all, the first “face” of the company an applicant comes in contact with. 1) Be warm and knowledgeable. Answering all candidate questions with warmth and enthusiasm seems to matter heavily in the eyes of the applicant. 2) You can never over-communicate. “No news is good news” does not apply in recruiting. As a recruiter, I try to let my candidates know of their application status weekly and will send them an email even if just to say “I don’t have an update for you yet”. This goes a long way. Be honest and keep the candidate as informed as possible – even if they are no longer being considered for the position. 3) Offer feedback. The interviewing candidate thought he was a good fit for the role, which is why he got to interview with the manager. Offer to provide any feedback on why they did not get the job, where their weaknesses were, and/or how they can do better next time. This falls under the “communication” category (see #2). 4) Be reachable. Whether it is by phone, email, or text messages, I try to make myself available to my candidates at all times. I will answer promptly when they have questions about the interview process, interview preparation, or candidacy updates. How many times have you felt your recruiter fell off the face of the earth? Not with me. I’m at your disposal for any question, big or small. On Twitter or LinkedIn. In the end, when a candidate has a positive experience, whether they were offered the position or not, they are more likely to recommend the company to a colleague or another candidate, or return again in the future for a new opportunity. That said, we promise to try to provide you with a great candidate experience. And, if we’re not, please let us know so we can fix it! We appreciate your interest and look forward to working with you. In the world of recruiting, building and keeping relationships are key for both parties. As a recruiter, it benefits us to “keep tabs” on our best candidates, even if we don’t have an opportunity for them right now. At some point down the line, we will have the perfect opportunity for you and we will reach back out to you to check your interest. As a candidate, it is in your best interest to maintain a good/professional relationship with your recruiter since they may have the keys to your dream job… in a couple of months. I cannot tell you how many times I have cut someone out of my network simply because they called 10 times too many in the course of a week, or how many times candidates lowered their “professional wall” because they were not an active viable candidate. 1) Know your skill set. I have received a number of emails from a number of candidates expressing interest in any and all job openings posted to our job boards. Did you read the opening and the requirements? If you don’t have the skill set we are looking for, you will likely not hear back from us. 2) Be positive. “Do you KNOW who I am?? 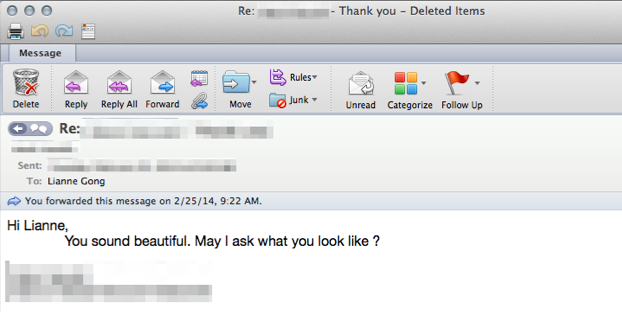 I am ’s #1 sales rep and your email is offensive, rude, and unwanted. Please take me off your spam list.” You got it. Coming off as rude will, almost always, put you immediately into our “trash” file. We are just doing our jobs, and our jobs are to find the best talent out there for our company. A “thanks, but no thanks” works wonders, and may work in your benefit down the line. 3) Network. Whether you are working with an agency recruiter or an in-house recruiter, it’s likely that you have a network of colleagues (or former colleagues) that they may be interested in. Making this relationship a mutually beneficial one will help keep you on top of a recruiter’s mind. On the other end, connect with the recruiter via a social media outlet like Twitter or LinkedIn. Many recruiters are utilizing Social Media tactics to attract and advertise to new talent. 4) Mind your manners. When I was in sales years and years ago, I remember being trained by the renowned motivational/sales trainer, Zig Ziglar. While the outline of his presentation was “Will + Skill + Refill = Success”, he stressed the importance of etiquette. Calling four times a day, leaving no messages, “Following up on my follow up” emails are not the way to win anyone. A call/message and/or an email once a week is fine. Anything more and you run the risk of making yourself look like a pest. Sell yourself appropriately. 5) Express thanks. Today’s recruiters are very proactive, versus the reactive nature of yesteryear’s. We are headhunting and talking to candidates who are not actively pursuing other opportunities. We don’t win over every candidate, but we appreciate your appreciation. Always. As a recruiter, I ask you to heed some of the above advice. In return, we promise to keep you in mind for your dream job, speak great things of you to hiring managers, and to provide you with valuable and constructive feedback. As a recruiter, there have been plenty of situations that I have come across that have left me scratching my head. I once had a candidate who came in to interview at a very business-formal office. He arrived wearing sweatpants (not joking), then asked for a bathroom so he could change… into jeans and a t-shirt (also not a joke). He asked me to take his bag to his car for him so that no one saw anything “suspicious”. The interview day proceeded to unveil a slew of surprises – he didn’t know the company or position he was applying for, did not bring copies of his resume, did not have any questions prepared, and started using inappropriate language with the interviewer! Little did he know that just because he was an employee’s son, it did not serve him well to disregard interviewing etiquette. Below are some of the biggest interview mistakes. 1. Weak handshake. A good handshake can really make or break an interview; they help make those first impressions. A handshake should be firm (but not too firm) and enthusiastic. Maintain eye contact with the other party, and smile. 2. Being late, sometimes VERY late, to an interview. Nothing makes a worst impression on your interviewer. It shows, not only disregard for their time, but also gives some insight to how you may be as an employee. Leave absurdly early to ensure you are on time to your interview. However, beware. Do not arrive TOO early to your interview site. “Only fools rush in.” If you are early, head to the closest coffee shop or restaurant. 3. Being rude to the receptionist. Oftentimes, EVERY party involved in the interview process (from recruiter, to receptionist, to managers) take a part in the hiring decision. If you are rude to the front desk, how will you act towards other colleagues? Smile, be courteous, and treat them as if they are your employer. 4. Dressing incorrectly. The rule of thumb, “don’t judge a book by their cover”, goes completely out the window when it comes to interviews. A lot of the time, the decision as to whether or not they like you is made within the first few minutes. The remainder of that interview only helps the interviewer validate their initial judgment. First impressions count. 5. Bringing a friend. We understand that you may have nerves, or that you needed a ride to your interview. But actions like this scream “dependency” and most employers want someone who is independent and ready to do anything at a whim’s notice. Leave them outside the building, and especially outside the reception area. 7. Saying negative things about your former employer. It is a shame you were fired, or that you didn’t get along with your boss, or that you hated the corporate structure. Leave those feelings at home, and don’t ever badmouth your former workplace. This will only brand you as a complainer. Instead, focus on the positive things you took away from the experience and find ways to grow from it. 8. Name dropping. Your attempts at playing the “I know so-and-so” can backfire terribly. Many employers will, no doubt, contact these individuals and ask for “backdoor references”, and they may not come back favorably. A better way to use internal contacts is to have your contact introduce you directly to the appropriate individual. Bear in mind that these are just guidelines. But also be aware that as much as you are being interviewed, you are interviewing the company for the best fit for yourself. So, take an interest in your career path, and take these informative meeting seriously.